Part one of a three-part series highlighting UFO-nuke documents. The subject of UFOs spotted at missile bases and other sensitive nuclear facilities has received quite a bit of attention in recent years thanks to the great research of longtime ufologist Robert Hastings, author of the book UFOs and Nukes – Extraordinary Encounters at Nuclear Weapons Sites. Hastings was also the sponsor of a significant panel of former military witnesses of these incidents at the National Press Club (NPC) in Washington, DC on September 27, 2010. He wrote the cover story, “UFO/Nuclear Connection,” for Open Minds magazine issue 7 (April/May 2011), where he discussed the media impact of his NPC event. I have transcribed the article exactly as it was published back in February of 1982, except for the correction of a few typos. However, I’ve added at the end some of the official documents mentioned in the original story, so you can read the full document and not just the quotes excerpted in the article. We often hear the statement that UFOs, whatever they are, have a tendency to buzz atomic plants and other similarly sensitive military and industrial installations. This is naturally used to support the theory that UFOs are extraterrestrial devices which understandably are engaged in a systematic surveillance of the Earth’s military and industrial resources. And yes indeed, there is enough evidence to verify the assertion that UFOs do fly over atomic plants. 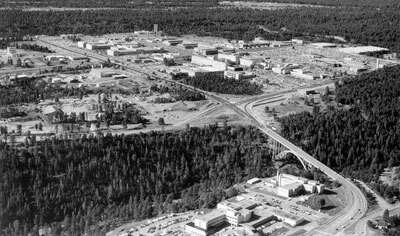 This is not based on hearsay or unconfirmed press accounts, but rather on dozens of declassified U.S. government documents from agencies such as the CIA, the FBI, the U.S. Air Force and the U.S. Army, and last but not least, the Atomic Energy Commission (AEC). These documents have been obtained under the Freedom of Information Act by Dr. Bruce Maccabee, now with the Fund for UFO Research, and New York City attorney Peter Gersten, for Citizens Against UFO Secrecy (CAUS) and Ground Saucer Watch (GSW). But let’s plunge into the evidence. Because the flying saucer phenomenon followed closely the growing development of atomic energy, it shouldn’t come as a surprise that both subjects became mixed up in more than one opportunity. Take, for instance, a July 18, 1947 FBI memorandum concerning the opinions of an informant, a nuclear scientist from Stamford, Connecticut, about “flying saucers.” The memo’s sub-headline reads “Atomic Energy Act,” and the scientist (name deleted) had worked at the MIT’s Radiation Laboratory during the Manhattan project, and was employed at the time the memo was written with the American Cyanamid Research Laboratory in Stamford. The possibility that UFOs were really “nuclear-propelled missiles” was discussed in another lengthy FBI memo, dated January 10, 1949. An FBI agent in Knoxville, Tenn. had received a “voluntary” visit by a Mr. Roterman, who was “the principal army technician at the Nuclear Energy for the Propulsion of Aircraft Research Center at Oak Ridge, Tennessee,” according to the document. Flying saucers had already been sighted and reported at Oak Ridge itself, and a concentrated flap would follow in 1950, as we shall see in our next article. When the Central Intelligence Agency became seriously involved in the flying saucer situation during the early ’50s, they seemed to be much more cautious about confusing saucers with missiles, although they certainly did notice and research a link between UFOs and atomic energy. 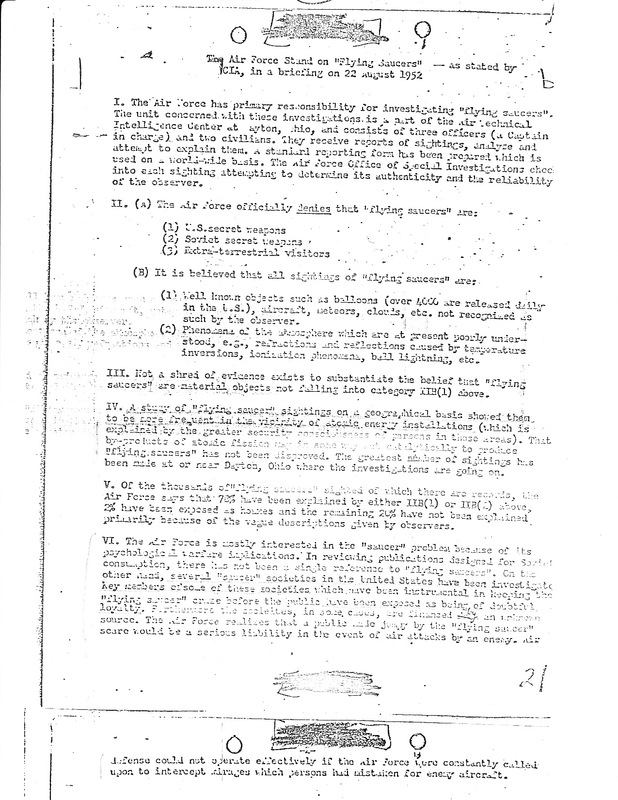 For example, a CIA document based on a briefing with the Air Force, dated August 22, 1952, states that “a study of ‘flying saucer’ sightings on a geographical basis showed them to be more frequent in the vicinity of atomic energy installations,” to which the CIA added in parenthesis, that this could be “explained by the greater security consciousness of persons in those areas.” Yet the fact remains undisputed that before 1953, when President Eisenhower launched his famous “Atoms for Peace” campaign, UFOs had been spotted frequently over all of America’s top nuclear research facilities, including the restricted areas around Los Alamos and Sandia Base in New Mexico, the Hanford AEC plants and waste disposal sites in Washington State, the Oak Ridge nuclear facilities in Tennessee, and the Savannah River Plant in South Carolina. With Headquarters in Fort Sam Houston in San Antonio, Texas, the Fourth Army was responsible during the early post-World War II era with the protection of Los Alamos and Sandia Base in New Mexico, and Camp Hood in Texas. All these restricted areas were the subject of numerous unexplained sightings between 1948 and 1950. 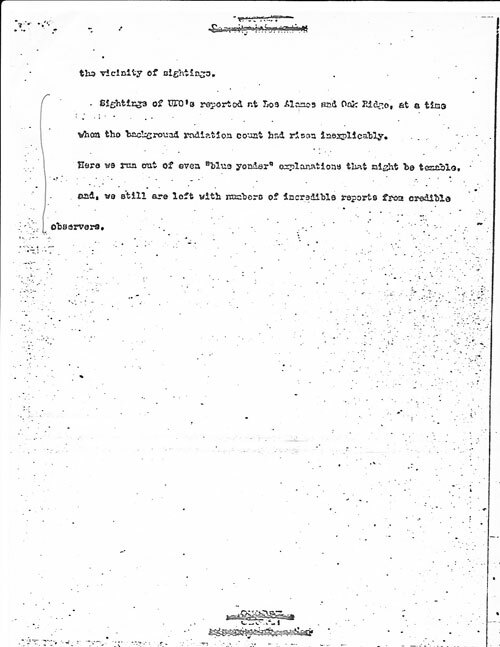 One Fourth Army document, dated July 2, 1949, gives a complete “Summary of Observations of Aerial Phenomena, Camp Hood, Texas,” indicating that “over 100 men and officers have observed and reported the phenomena.” Termed “fireballs” for lack of a better name, some objects were described “round” and others with “diamond or oblong shape.” Beginning on March 6, 1949, the phenomenon was said to appear at Camp Hood “on the average of every nine days,” and it was determined that no conventional aircraft had been flying at the time. Other documents show that similar fireballs “of an intense white or greenish white” had been observed several times by “security inspectors at Los Alamos AEC project,” as well as by sentries at Sandia Base and Kirtland Field. 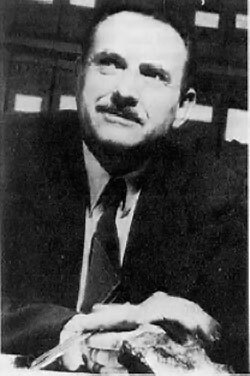 Furthermore, meteorologist and astronomer Dr. Lincoln La Paz, from the University of New Mexico, was pproached by the Air Force Office of Special Investigations (AFOSI) to cooperate in the ongoing investigation. One of the Fourth Army documents states that “Dr. La Paz has, from descriptions of observations furnished him and, BY PERSONAL OBSERVATION, determined that the objects sighted are NOT natural meteoric phenomena.” (Capital letters and emphasis in the original). In his classic book, The Report on Unidentified Flying Objects, the late former Project Bluebook Head, Captain Edward J. Ruppelt, revealed that at one point the government was so concerned with the fireballs around Los Alamos that a high level scientific conference was called in. Dr. Edward Teller, the father of the H bomb, Dr. Lincoln La Paz, and other luminaries were among the participants. Eventually the Air Force established Project Twinkle, under Dr. La Paz, to study, photograph and measure the phenomenon with three “cinetheodolite stations” near White Sands, New Mexico. It is generally recognized, however, that by the time Project Twinkle finally became operational, the concentration of fireballs had also began to die out, so that no significant data was obtained. Yet the presence of “flying discs” around vital atomic plants was by no means over. (See the enclosed letter from USAF Lt. Col. Doyle Rees to the Director of AFOSI in Washington, Brig. Gen. Joseph Carroll, covering the entire fireball issue. The document was obtained under the Freedom of Information Act and disseminated by attorney Peter Gersten). July 13, 1947 FBI memo, re. 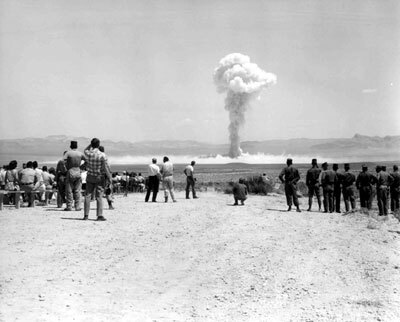 “Atomic Energy Act,” with information provided by an informant who was a nuclear scientist at the American Cyanamid Research Labs in Connecticut. 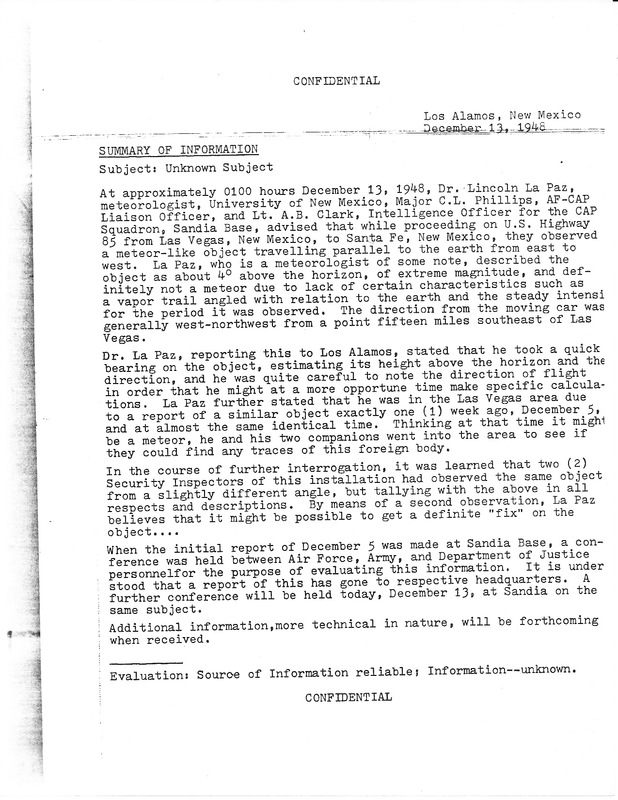 Confidential report from Los Alamos, dated Dec. 13, 1948, regarding Dr. Lincoln La Paz’s own sighting of a fireball. December 1948 document from Headquarters Fourth Army in Fort Sam Houston, Texas, re. “Unidentified Flying Objects New Mexico,” summarizing the investigation of the so-called green fireballs seen in Los Alamos and other sensitive locations. July 2, 1949 “Summary of Observations of Aerial Phenomena” from the G-2 Headquarters of the Fourth Army in Fort Sam Houston, Texas. Am teaching a course to senior citizens at Widener University’s Exton Pennsylvania campus. It is funded by a foundation the OSHER LIFELONG LEARNING INSTITUTE (OLLI). It is for enrichment only and has no credit value toward any degree. Class is enthusiastic about Extraterrestrial intelligence and communication with mankind. That is the name of the course. I am a retired trial lawyer with an abiding interest in the UFO phenomenon. Any videos that you can supply or that I can download on the topic of UFOs and nuclear power plants and/or ICBM stations would be appreciated. My kind has been visiting your planet for eons. Recently, it came to our attention that your species has progressed to the point of escape from your domain. Ordinarily, this in itself, would not have been a problem. However, the fact that you have shown fatal aggression between your own species and had obtained the knowledge to release the power of the atom concerned us. Therefore, we will be monitoring you progress over the next two thousand years, until you have demonstrated the ability to rise above your regressive tendencies for assaultive behavior.